Sudan is at a crossroads. 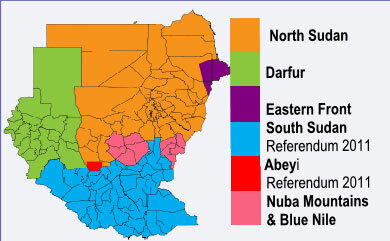 The “interim period” that helped to end the twenty two year civil-war in 2005 is coming to an end and in January 2011 the people of southern Sudan are due to vote in a Referendum to decide whether they remain part of Sudan or succeed and become an independent state. There are fears that efforts will be made to prevent the voting or that the results will not be respected. If this happened it is likely that war will erupt again. The last time over two million people died and millions more were made homeless. Khartoum – “There are at least four villages in Western Equatoria where people live in real fear of new attacks by the Lord’s Resistance Army (LRA),” Bishop Edward Hiiboro Kussala of Tombura-Yambo, southern Sudan, tells Fides. Several aid agencies have issued warnings in recent days about possible attacks by the Ugandan guerilla group which controls a vast area stretching from south Sudan to the south-eastern Central African Republic, passing through the north-east of the Democratic Republic of Congo. Lord Jesus, you said to us; “I leave you peace. My peace I give you.” Look upon us your sisters and brothers in Sudan as we face this moment of referendum. Send us your Spirit to guide us. Give us the wisdom we need to choose our future where we will know your true peace. You call us out of slavery, oppression, and persecution so that we may have life in abundance. Grant us peace with one another. Give peace among ethnic groups. Help us to work together for the good of all. We ask this in your name, Jesus our Lord. Amen.